Video walls and electronic scoreboards that will take you to the next level. Bring large-scale video and electronic scoreboard capabilities to your events with a state-of-the-art indoor LED video wall. Turn any wall or surface into a dynamic infotainment centerpiece, and take your organization to the next level! 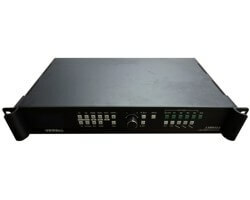 Our VividStar model can easily switch between multiple video sources with the press of a button. 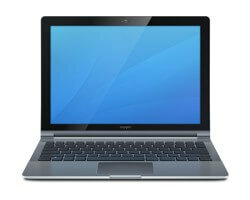 Use cameras, laptops, DVD players and more to play live or prerecorded video. With our optional multi-sport software, bring the crowd to their feet and give your sporting events a professional feel. A low-maintenance alternative to expensive and bulky projection systems, our signs provide vibrant images that look amazing from any distance. You can even use your new video wall to generate revenue; sell ad space to local businesses and watch your organization thrive! We really want to build a program around this thing, teaching students what a sports broadcast can be like from a live prespective. The scoreboard possibilities at Altamont are very exciting for our program. It will be a revenue stream... forever! Every time we bring somebody into the gym they're AMAZED, at the new facility but then especially with this new LED screen. The technology that will replace your projector and traditional scoreboard! We also proudly offer Outdoor LED Signs! Enjoy easy multimedia input, streaming video and picture-in-picture, plus unrivaled reliability and no-fuss maintenance. Contact us for a full list of indoor LED sign features. Display full screen video, animations, advertisements and game statistics. Promote upcoming events and use as a presentation tool. Stream live or prerecorded video and play DVDs. Combine engaging effects, graphics and sound. Highly customizable scoreboard software available. 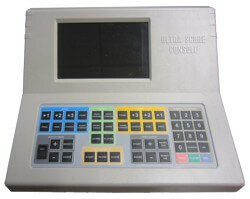 Console, video processor, shot clock and match timer available. An industry-leading 5-year product warranty is included. With our video processor component, streaming a video feed is a snap! Simply connect your video equipment or computer to the standard input, and press the selected input button. Use for live video streams with a connected camera, or with pre-recorded video played on a connected laptop or other digital video equipment. Full screen and picture-in-picture formats are available. Combined with speakers and audio output, your new screen turns into a full multimedia delivery platform. Stream live presentations and movies, advertise local businesses and sporting events, and engage everyone in your facility. The applications are endless! In the event that maintenance is required, we make the process painless. LED modules are front-serviceable (can be removed from the front of the sign), and are removed using an innovative magnetic attachment system. We also know it's critical that a scoreboard and video presentation platform just work. With that, the video wall is built with reliability in mind. Redundant systems such as dual Ethernet connections are built into the sign, and all of our products and their components undergo rigorous third-party testing. More and more, organizations are discovering the power of indoor LED video walls to create amazing multi-media presentations. This new technology will give your facility the "wow factor" to entertain and engage any audience. 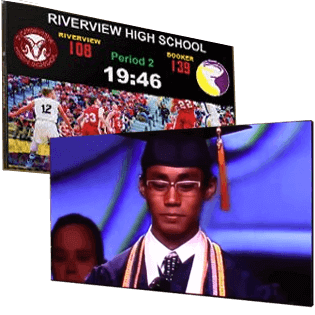 In the long term, customers also find that video walls tend to be lower cost, more reliable and more versatile than a traditional projection system. Here are some of the benefits you should expect with an indoor LED video wall. Simply put, there is no contest when comparing brightness and contrast between LED video walls and projection systems. As the surface of the video wall itself emits the light you see, colors are more vibrant and light more brilliant. This is important because the amount of ambient light and distance from the audience can affect the quality of the image they see. Perception of brightness is also non-linear, which means that you need much more than twice the actual brightness to make an image appear twice as bright. So how can you compare brightness between an LED video wall and a projection system? The brightness of an LED video wall is measured by the maximum luminance (brightness) of a one square meter section of the LED display. This unit of measurement is called a nit. With a rating of 2,000 nits for our video walls, your display will be capable in any kind of lighting environment. Comparing it to the brightness of a projector is not so straightforward. The overall maximum brightness of the projector bulb is measured in lumens. As the projector gets farther away from the surface it is projecting on, the brightness per square meter decreases (think of this as the same amount of light spread over a larger area). The color and reflectivity of the surface also influence how much light is bounced back to the viewer. Because of this, the equivalent "nit rating" of a projector depends on its lumen output, as well as the distance from and materials of the projection surface. 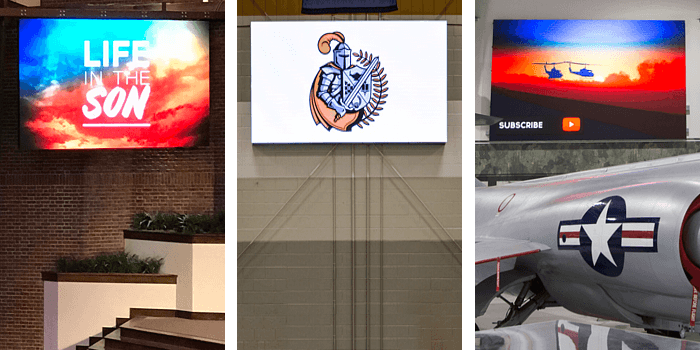 Even with a perfectly white surface, in order to illuminate an area the size of our most popular video wall (6'3" x 11'7") at 2,000 nits, you would need a projector with an output of over 43,000 lumens! * This is more than eight times the brightness of most "large venue" front projectors that cost many tens of thousands of dollars. This light is also not evenly distributed, as the center of a projected image is typically the brightest, with the light decreasing towards the edges and corners. The contrast (difference between dark and light areas) is directly related to brightness. As the ambient light increases, the image source must be brighter to avoid becoming "washed out". Projector bulbs are typically rated from 3,000 to 10,000 hours of life, depending on the model and brightness settings. These bulbs emit an enormous amount of heat and will often burn out at inconvenient times. Most are very expensive to replace, and have a limited "shelf life" even when not in use. Dust and dirt can accumulate on projector lenses and filters, requiring routine maintenance. Even small variations in temperature and moisture can significantly shorten product life, as can turning off and on the projector in quick succession. Many internal components cannot be self-serviced and require expensive certified technicians to fix. In contrast, LED video walls are intended as zero maintenance products with no parts needing routine replacement. The LEDs themselves are rated for 100,000 hours of use (over 11 years at constant full brightness). Heat generation is minimal and components are not sensitive to most indoor temperature and moisture conditions. In the unlikely event that a part should fail, servicing can be done by anyone that can use basic tools such as a screwdriver. Both front and rear projection systems require clear line-of-sight to their screens. Depending on the type and mounting location of the projector, this area can be large and becomes unusable for other purposes. Unlike front projection systems, presenters and equipment can be positioned directly in front of the video wall without casting shadows or being front illuminated. Unlike rear projection systems, a video wall does not require a dedicated projection room behind the screen. The number of pixels (discrete points of light) of an LED display will typically be less than that of a high-definition projector. While we can make any size display, our standard 480 pixel high model is less than half the pixel height of a 1080p projector. However, again the distance to the audience comes into play. Imagine looking at a high-definition TV from five feet away versus from 50 feet away. At larger distances, the amount of detail in the image is no longer discernable. Instead, the size of the screen and its brightness become much more important. Speak with a representative to determine the resolution you will require for your video wall. These signs are available in a wide variety of sizes to suit your needs. Below are just a few of the most commonly requested sizes of signs. Contact us to learn more. Don't see the size you need? Don't worry! We can create almost any size indoor LED sign. Contact us to learn more. Our indoor LED sign can be equipped with optional software and hardware components to enhance its capabilities. Contact us, to learn more about these options. Live scoreboard features and related components for basketball, volleyball, wrestling and many more sports are available. Highly customizable, and can display animations, advertisements and game statistics. A laptop PC is available pre-installed with our powerful scoreboard software. The software can be used to customize scoreboard information before the game, and to control score and time information at game-time. This physical console allows your game officials to keep up with quick-moving action. The console and PC software are automatically synced whenever a change is made, and updates to scores, times and other game data can be made from either device. 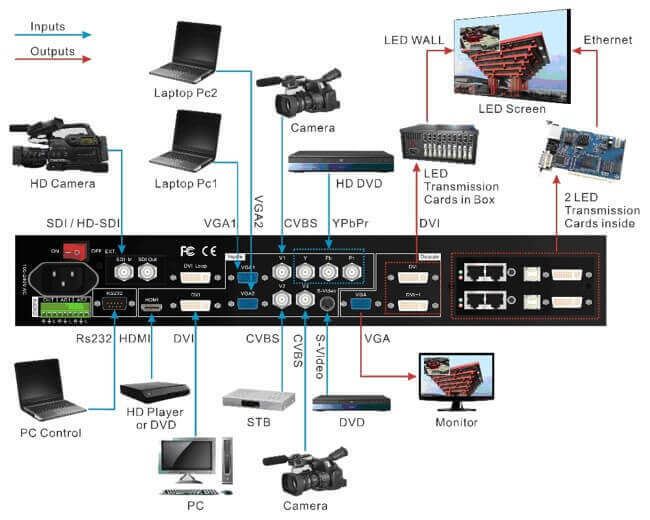 A powerful video processor is available that allows video input from multiple devices. Use cameras, laptops, DVD players and more as sources of live or pre-recorded video. The quick-use buttons on the front of the processor allow instant switching between scoreboard, full-screen video and several picture-in-picture formats. 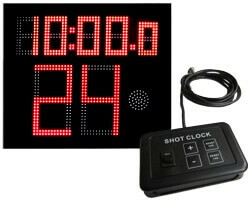 A separate LED unit can be used to count down play times. A hand-held controller allows a dedicated timekeeper to reset times to 24 or 14 seconds, add or remove seconds, or turn the entire unit on and off. 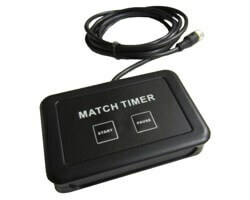 A separate hand-held controller allows a dedicated timekeeper to easily start and pause the match time without requiring access to the software or control console.